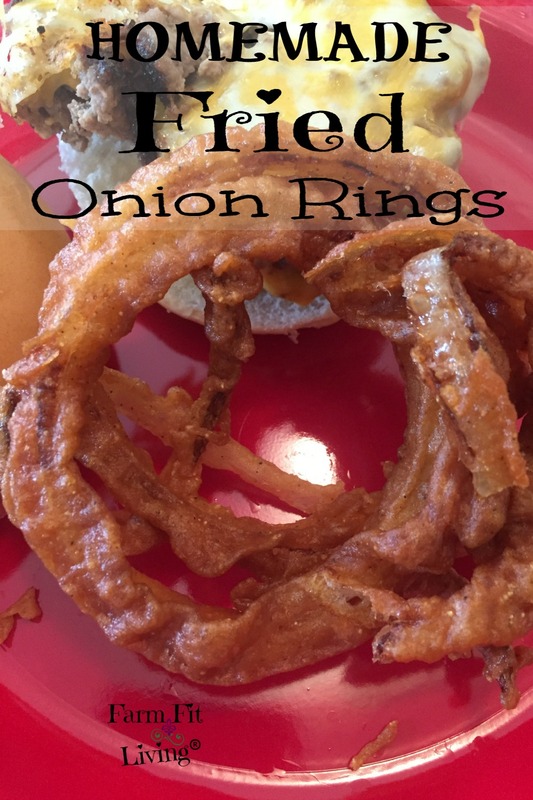 If you’re in the mood for some delicious comfort food and have a multitude of onions, consider making these delicious homemade fried onion rings. Homemade fried onion rings are a great way to use up onion slices from leftover BBQ’s or parties. 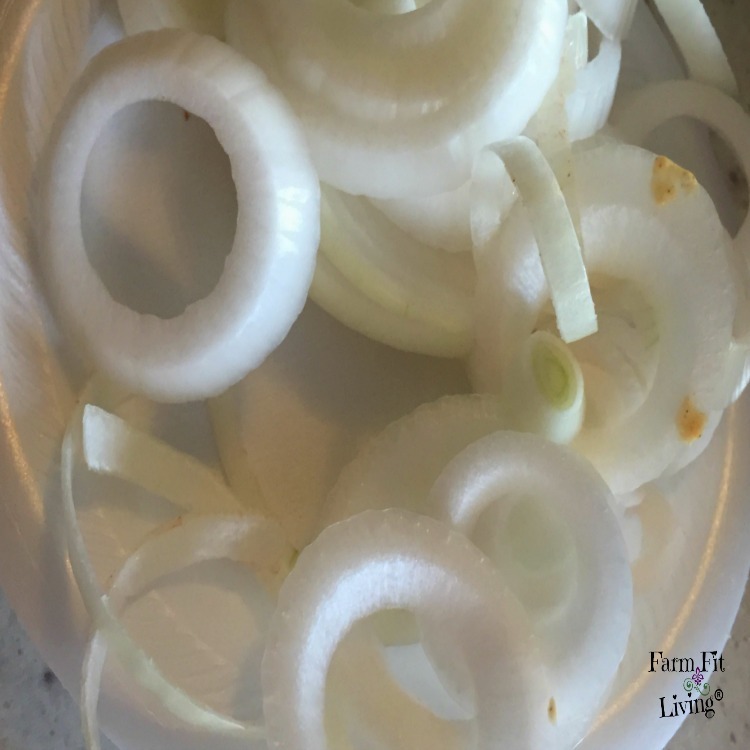 Typically, onion slices are popular toppings for burgers during our summer family get togethers. Our daughter’s birthday is in June and we always BBQ at our home. Our farm fresh ground beef make perfect hand crafted burgers that everyone loves. A raw sliced onion on top just gives the burger a little more pep. But, not everyone loves onions. We always have a bunch left over, so we find a way to use them that the whole family loves. Who doesn’t love onion rings? Especially homemade ones that are so delicious as a side. Here’s how we make our homemade fried onion rings from onions right out of the early spring garden. Separate the slices into rings by pushing them out from each other one by one. Mix the seasoning sauce according to the directions on the back of the box. It’s actually 1 1/2 cups of water plus the whole box of seasoning mix. 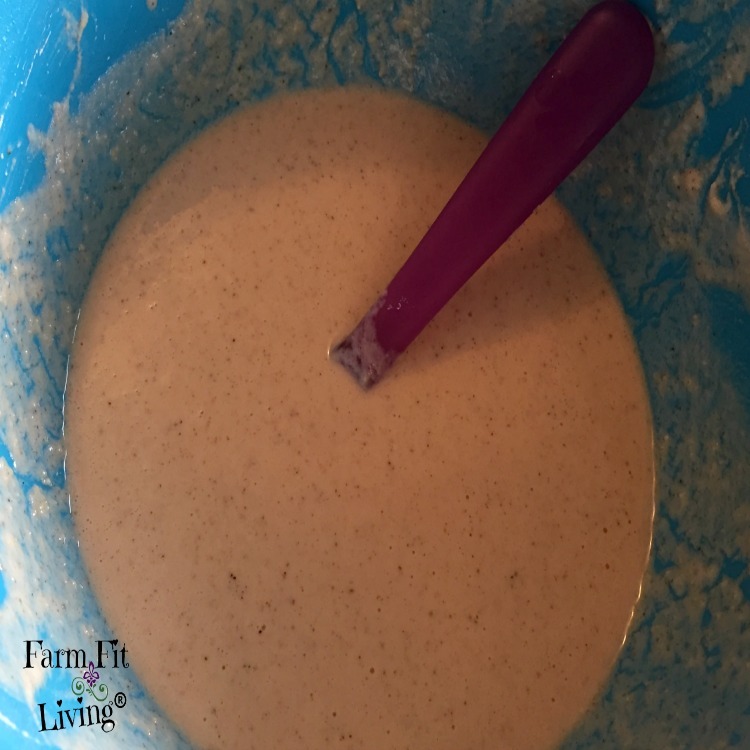 The mixture makes a nice creamy batter to dip the onion rings. Fill the fryer about half full of oil. Turn on the fryer to a high heat temperature and let the oil warm up. Next, put a few of the rings into the batter and soak them good. Use a fork and gently release the rings into the hot oil. Cover and let the onions fry for just 2-3 minutes. Check the onion after a few minutes. Dunk them back in for another minute or two if they aren’t as crunchy as you might like. It’s really up to you how you like your onion rings. I love my onion rings nice and crispy. So, I usually fry my rings for about 4 minutes to achieve that yummy crunch I love. After the onion rings are finished, carefully take them out of the oil. Do this using a fork. Place the VERY HOT rings onto a paper towel to let dry and mop up grease. Repeat until the desired amount of onion rings are made. Cover the remainder of the raw onions and batter. You can use it later. 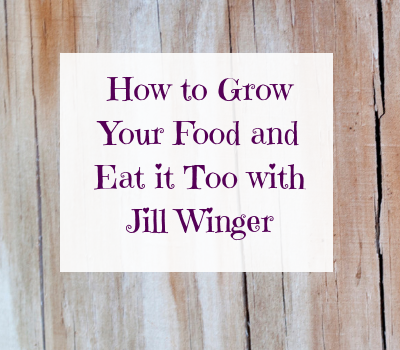 Just place it back into the fridge to use for another meal within a couple of days. So, there you go! But how do you grow delicious and crisp onions to use for yummy homemade fried onion rings? Well, I will honestly tell you that it’s so easy to grow onions. Onions grow from plants, seed or new bulbs. I buy new bulbs each year and that is what I recommend to home gardeners. Onions will be planted in many different types of soils. Great soil development starts in the fall before planting when organic material is added on. Adding the organic material in the form of leaves, compost, or old straw will help loosen the soil and provide necessary natural fertility for your garden spot. But no matter what type of soil is used, growing great onions for homemade fried onion rings requires good fertilizer and plenty of water. To know how much fertilizer onions need, it’s always best to test your soil. If you’re unable to test your soil, the rule of thumb is to apply one pound of all-purpose fertilizer per 100 square feet. Then, just till or work it in. You also should add nitrogen fertilizer (34-0-0) 2 to 4 weeks after planting. The rate is 1/2 pound per 100 feet of row. Simply sprinkle it on 2-3 inches alongside the row of onions. Then, water it in. A good watering rate for onions is 1 inch of water per week. You will have to manually water if you aren’t receiving it naturally. Watering also makes weeds grow, but simply mulching the onions can help promote weed control. You can hand weed or hoe if you just have a few. But, if you grow a lot of onions like I do, weeding by hand can be overwhelming. So, mulching with straw or black plastic mulch will really help. Finally, the onions are ready to harvest when they are at the desired size. Or when the stems are bent over you’ll know it’s time for harvest. Simply pull them up or gently dig. Use immediately or hang to dry in a nice cool spot for safe keeping. Why eat onions? They may not be everyone’s favorite, but they are very healthy. Onions contain a lot of Vitamin A and minerals necessary for body metabolism and health. Onions are also very low cal, which makes you want to eat more of them! They make great toppings for burgers and taco salads. We also love to make them into homemade fried onion rings for a low calorie farm fresh side with burgers or steaks. While fried options are usually typically upon, I argue that eating your favorite fried foods in moderation is A-OK! Because you only live once, right? It’s healthy to treat yourself to something fresh and homemade even it is fried. While fried foods are usually avoided in our family, they are loved by everyone. We eat fried vegetables and meats in moderation using the products we grow ourselves on our farm. We use Canola Oil as a healthier frying oil option and it works great. The results are crispy and delicious each and every time. It’s not every day that we get homemade fried onion rings, but it is a seasonal treat that is a delicious addition to our grilling season. So, grab some onions, a McCormick boxed seasoning mix and fry up some delicious homemade fried onion rings.